Answering the right questions will ensure the best design: Vacuum system selection is a process that evaluates several different types of systems. There are many choices in ejector systems and mechanical systems like liquid ring vacuum pumps, oil-seal pumps, rotary vein and piston pumps, as well as combination systems. No one type of system is best for every application. Therefore, parameters and guidelines must be set that will enable a rational selection. Energy efficiency is a major consideration, of course, with the cost of energy ever-rising. Nevertheless, it’s not the only consideration. Reliability may be essential. Versatility may be important. Low first cost may better suit the plant’s capital picture, especially in a system for intermittent use. Innovation may count, or alternatively, the operator may prefer to remain with the equipment known from past experience. The vendor’s record can be very important: does it have case studies to back up its statements; can it supply names of people to talk to? No single consideration is all-important. The interrelations of many factors should be studied, and the time to do it is before the equipment is ordered. These are the sort of questions process engineers should consider, as they begin selecting the right system for an application. What Are The Major Operational Considerations? : The first consideration, of course is required suction pressure. A liquid-ring vacuum pump operates in the rough vacuum range, from atmospheric pressure down to 50 Torr, and so it cannot be considered for higher vacuum applications. A multistage ejector system, on the other hand, can operate down to about .02 Torr. Some rotary vein and piston pumps are designed for an even higher vacuum. Equally important are the capacity requirements. Most mechanical systems are designed in set increments of capacity. The engineer selects the system closest to the requirements, usually on the side of oversupply. Most ejector systems are custom designed to meet the application’s specific capacity requirements. What Utilities Are Available? : If no steam is available, a mechanical system is probably a necessity, although some small combination systems use air as the ejector motive fluid. Where steam is readily available at relatively low cost “such as byproduct steam“ it pays to look closely at an ejector system. If the byproduct steam is quite low pressure, a combination ejector/liquid-ring pump using both low-pressure motive steam and electricity is a good choice. What Are The Suction Load Characteristics? : Is the load wet or dry, corrosive or noncorrosive? Some vacuum systems are more “forgiving” than others, i.e., better able to handle wet suction loads, less affected by corrosives or abrasives. 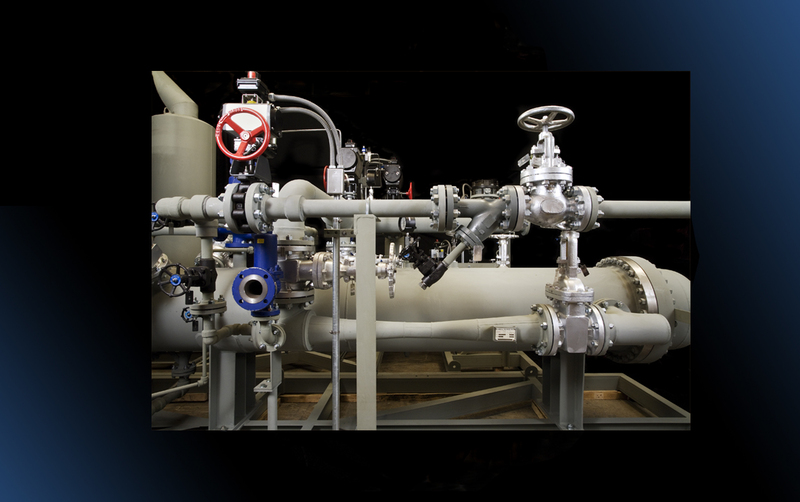 Ejectors and liquid-ring pumps handle wet process streams with little trouble. Some mechanical pumps, particularly the vein pump, are easily damaged by a wet stream or by unexpected liquid carryover. When considering how the system will stand up to corrosive or abrasive loads, materials of construction and method of operation should be analyzed. Because of their design simplicity, ejector systems can be made of of nonmetallic materials. Metallic mechanical systems can be made of various stainless steels, but not the nonmetallics. Clearances for moving parts must be considered in relation to abrasives in the process stream. A mechanical pump relies on very close tolerances, which makes abrasive materials a problem, whereas an ejector can handle a reasonable quantity of entrained particulates without excessive wear or damage. Another point to be considered is the relative ease of repair or renewal of the working parts. This is especially important in a system exposed to corrosion and/or abrasion. Will The System Be Used On A Steady Or Intermittent Basis? If it is necessary to operate a vacuum system on a continuous basis, the cost of utilities is obviously much more important than if the system is used only periodically. The process engineer might select a low-cost steam jet ejector for intermittent use, feeling that the higher utility consumption would be unimportant on an occasional basis. The more steady the use, other factors being equal, the easier it is for long-term savings to justify the much higher initial cost of a mechanical system. Will The System Be Used For One, Several, Or Many Different Processing Operations? A mechanical system may be an excellent choice for specific, clearly defined processing operations. On the other hand, ejectors are often best for a “house” vacuum (where many different services throughout the plant must be handled) since they are less seriously affected by wet loads, abrasives, corrosive vapors, etc., which may crop up when handling a variety of services. Is It Necessary to Recover Product Carried Over Into The Vacuum System? : In many cases product vapors are so valuable that it is profitable to recover them. In other cases, they must be recovered for environmental reasons. In these cases, the engineer must find out how the vacuum system is going to handle these vapors and what will be the best way to recover them. For example, if an ejector system is considered, one equipped with shell-and-tube type condensers will be wanted to keep the cooling water and vapors separate so the product can be condensed and recovered in pure form. Oil-seal mechanical systems can be a problem since product vapors will tend to get mixed with the oil. Worse still, in many applications, is when oil vapors mix into the product. Will The System Conform To Plant Guidelines For Water, Air, And Noise Pollution? The process engineer will want to determine what will happen to pollutants once they enter the vacuum system. Will the pollutants contaminate the oil, water or air; will a scrubber system be needed to remove contaminants in the process stream after they have passed through the system? Remember that with any type of system, the noncondensibles are eventually released to the atmosphere. The process stream handled by an ejector is mixed with steam, which condenses with any condensable vapors. In a direct-contact condenser, contaminants might be mixed with cooling water leaving the condenser. A shell-and-tube or surface condenser is used when the condensable vapors and cooling water should be kept separate. With a liquid-ring vacuum pump, contaminants may be partially scrubbed or condensed by the water in the liquid-ring. On the other hand, water treatment could be more expensive for the liquid-ring pump with a recycle seal water system. In oil-seal systems, contaminants may enter the oil, which will then require treatment. Otherwise, the contaminants may pass through to the atmosphere where they must be scrubbed. Another factor is the noise level of the operating system: what is the decibel level, and what can be done to reduce that level if necessary? Can Existing Vacuum Equipment Be Used With The New System? Where reliability is important, where occasional overloads are anticipated, and for other reasons, it is often a good idea to retain the old system as a backup for the new equipment. Also, and existing system can sometimes be retrofitted for higher efficiency, as in the classic case of an ejector system retrofitted with a liquid-ring vacuum pump replacing its final stages to reduce steam consumption. Where Will The System Be Installed: Indoors Or Outdoors, High Or Low Level? Sometimes special consideration will virtually dictate the choice of vacuum system. For example, if it is necessary or desirable to install the vacuum system outdoors, and freezing weather is a probability, a mechanical system can pose a problem. The ultra simple ejector system may be the best selection. If a tower is available, a high-level ejector system with barometric condenser might be the economic choice. If the superstructure isn’t already existing, howler, construction costs may be prohibitive. A mechanical system or an ejector system with shell-and-tube condensers and condensate receivers would be the necessary choice for ground-level installation. What Is The Expected Service Profile Of Each Vacuum System? How reliable can the vacuum system be expected to be under normal operating conditions, and how much abnormal operation can it be expected to withstand? What is the expected annual downtime for each vacuum system being considered? The process engineer needs some idea of how much maintenance a system requires to keep it running satisfactorily. Downtime and the need for spare parts, system renewal or replacement must be projected. In some industries, any downtime may be prohibitive in terms of money or service disruption. Downtime is quite predictable in terms of the type of system, from simple ejectors through liquid-ring pumps to more complex mechanical systems. Experience of other users can also be quite revealing. This is one point where it may pay to ask the vendor for a list of representative customers to contact. What Kind Of Maintenance Is Required For Each Type Of Vacuum System; How Difficult Is It To Perform? How many people is it going to involve, how long will it take, is complex machining involved? Does the unit have to be taken offline and removed to the plant repair shop for maintenance, or can it be overhauled online? Can all maintenance usually be performed by plant personnel, or will the unit have to be returned to the manufacturer for rework? Ejector systems are simple as well as reliable, so replacing the nozzle or diffuser every 2 to 5 years is often all the maintenance that is required. A liquid-ring vacuum pump is about as complex as a standard centrifugal pump, so it is usually only necessary to replace the impeller, shaft or seals. The more complicated mechanical systems, with there close tolerances, may require remachining or part replacement, realignment and recalibration. These high-technology operations may have to be performed at the factory or by special service organizations. Auxiliary equipment: how much is needed for the equipment and for the system; is it included in the original specifications? Installation costs: how difficult will the system be to install, how many man-hours are required, what special equipment will be required? Will any further engineering be needed to get the system operational? Yearly operating costs: cost of steam or electricity on a steady or intermittent basis; operating man-power to run the system; estimated yearly maintenance costs. Spare parts and inventory costs: which parts are subject to regular replacement? What do they cost, how readily available are they, should they be inventoried in-house? Cost of buying and operating pollution control or water treatment equipment, if required of the system in question. There is a lot to think about in selecting an optimum vacuum system for any specific application. Factors of overriding importance in one case may be secondary issues in another situation. It’s a good idea to consider every factor, and weigh them in order of anticipated importance for the case-in-point. Then, when all the factors are evaluated, you can rationally select the equipment you feel will be the best for your plantâ€™s vacuum system.